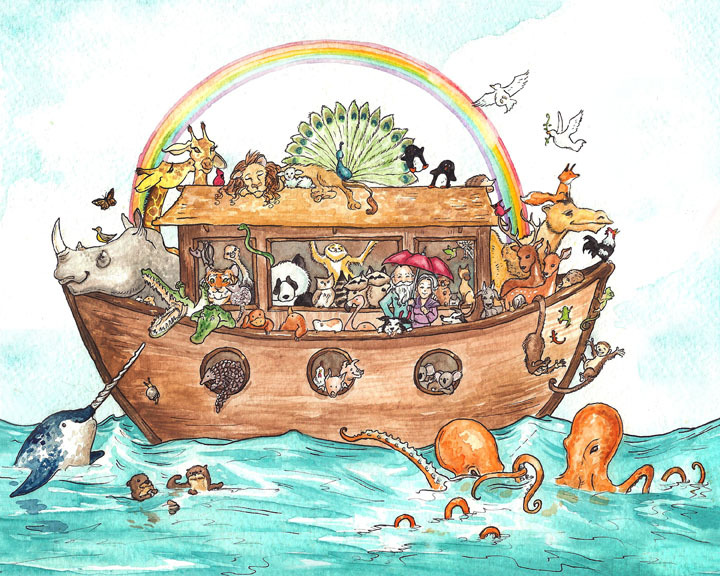 My Noah's Ark painting is finished! I began it back in December, and returned to it last week. Today I added it to the shop here. When I was a kid I always wanted to see more animals in Noah's Ark illustrations. 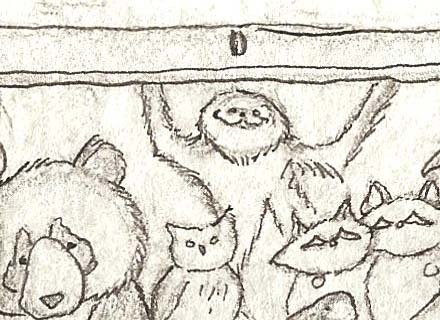 He took in every animal on Earth, and yet it always seems like he was only hanging out with two elephants, two lions, a pair of giraffes, and maybe a few birds. I wanted this ark to be brimming with creatures of all walks and sizes! I figure the giraffes probably spend a lot of time on deck. cleaned up after every animal on Earth--she deserves to be included. I couldn't leave out the Octopi. Look at those Otters. Just look at them. 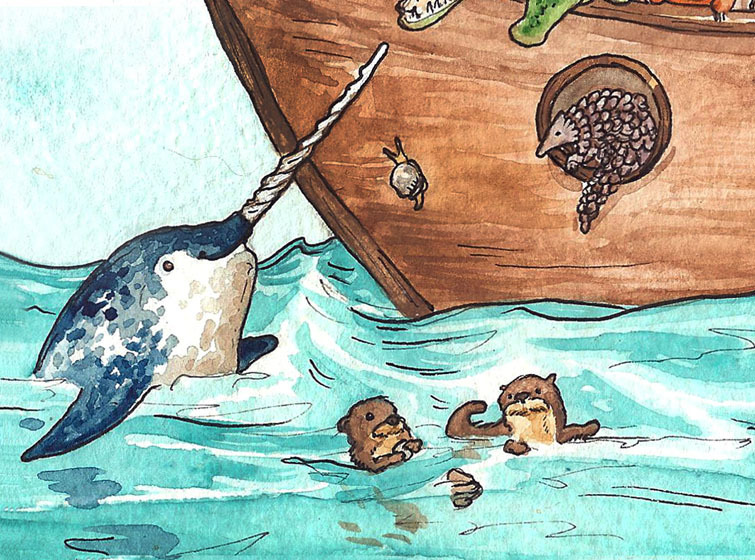 The sea creatures can't be on the Ark, but they can visit. To let you in on the scale, that peacock is about 2 by 2.5 inches big. 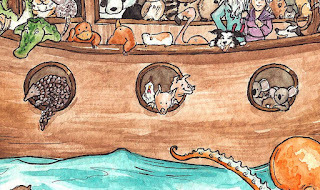 The portholes are filled with critters peeking out. 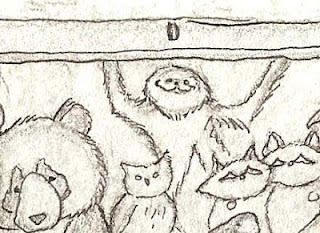 I plan on including a checklist with each print of all the creatures, so folks can pick them out for fun. 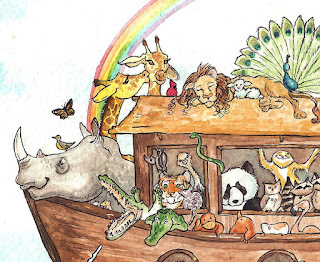 I figure it's a cute way to teach little ones about Noah and learn about animals, or just a fun challenge for older folks. 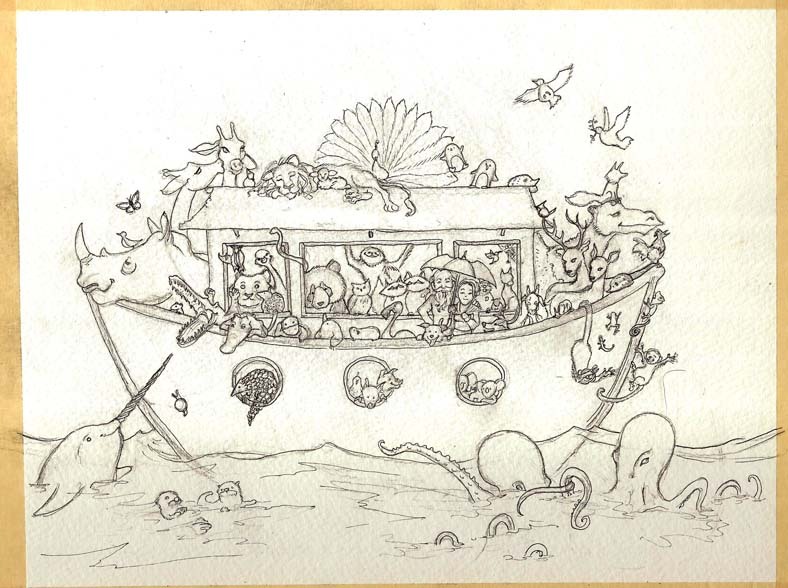 Here are some photos of this illustration's progression! Here it is sitting on my desk last week, the day before I picked it back up. Pencil and pen, waiting for paint. 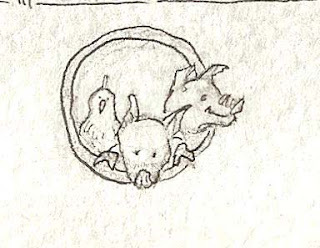 A hen and two piggies checking out the view. when you try and use your teeth to twist a stuck cap. Finished rainbow and the wood wash.
Ark, sea, sky, and rainbow finished! 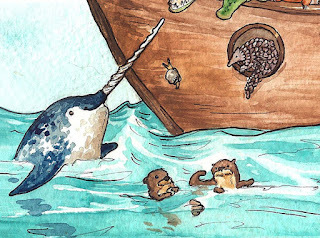 Close up of the first creature washes. 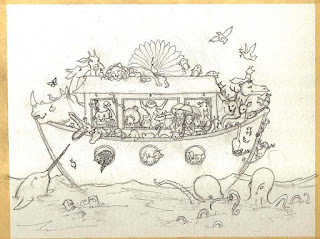 Re-inking the illustration after painting. I don't usually share this part of the process, but it's important to creating a good print from a painting. 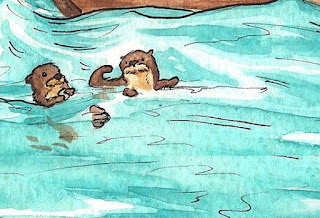 Often when a painting is scanned the scanner washes out/muddies the colors. 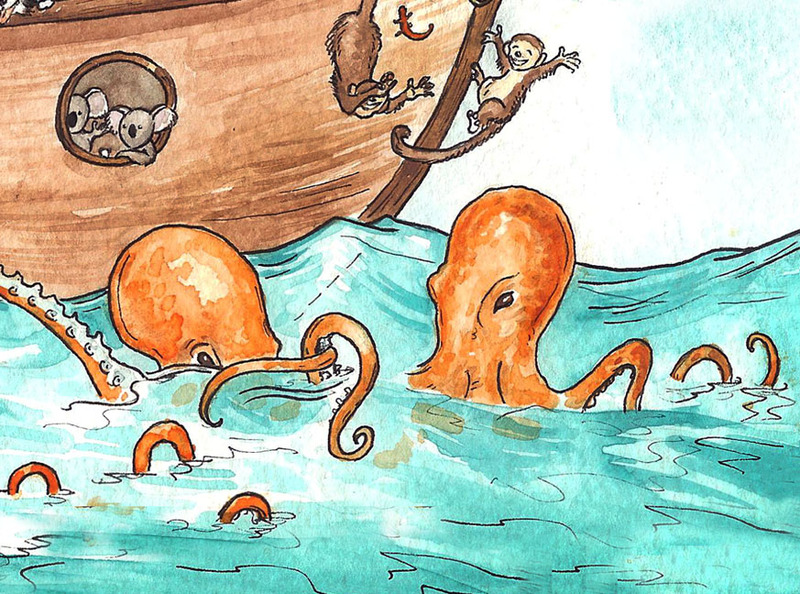 Once an illustration is scanned, it's crucial to go into Photoshop and adjust the color levels to recreate the hues to look true to the original. I'm fortunate to have a second set of artist eyes to look work over, Ryan sometimes assists me when it comes to the digital end of transforming an illustration into prints. He helped me with this one, and I snapped a few photographs while I was waiting. helping me to correct the blues in the scan. Using the original painting as a reference. 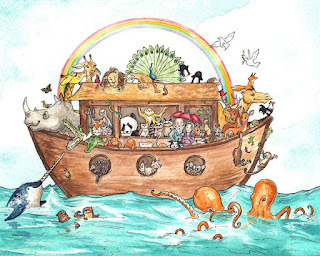 Noah's Ark has always been one of my favorite tales. For some reason I desperately loved stories of folks hunkering down and pulling through a natural disaster when I was little. Growing up in New England, we faced the threat of hurricanes and nor'easters every summer it seemed. It made an early impression I guess. More than once I frantically gathered all my stuffed animals onto my bed and we set sail for forty imaginary days and forty imaginary nights across my bedroom. I would hurl my parrot doll into the ceiling to search for land. Sometimes the clouds would part, the Heavens would shine, and Mom would interrupt with a peanut butter and honey sandwich and the gentle warning, "Quiet down, Noah." My friend Jackie is a veterinary technician with dreams of one day running her own animal sanctuary. She recently told me she liked the rescue aspect of the story, and I had never thought of it that way. Really, Noah is one of the first examples of an animal activist. I just thought that was so cool I had to share it. 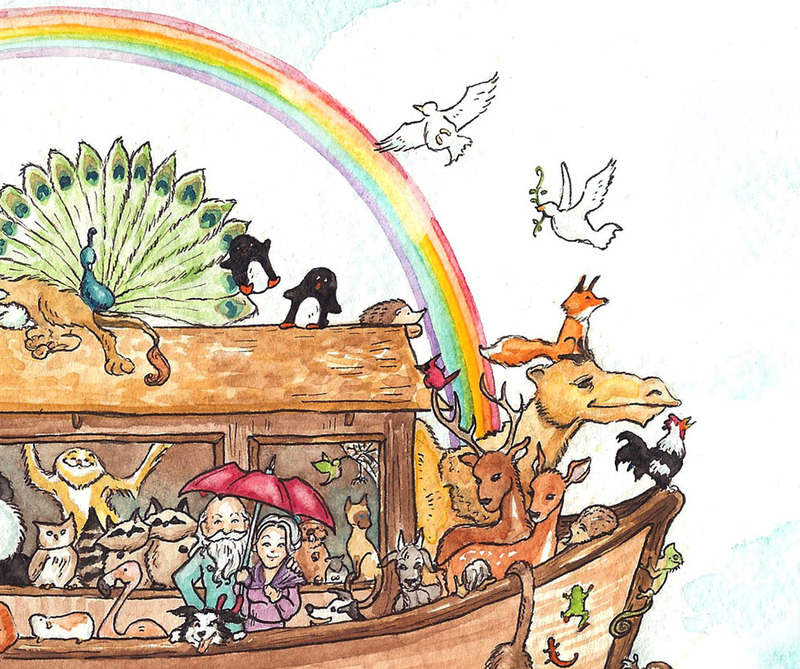 It made me look at Noah and his Ark a whole new way. If you'd like the checklist of critters to look for in the pictures above, shoot me an email at pseudooctopus@gmail.com and I'll hook you up! 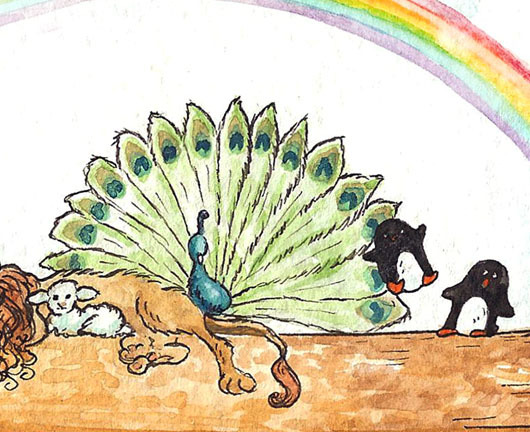 I love the koala bears, and the rainbow! This is just so cute. I still love stories about people "hunkering down and pulling through a natural disaster". I love the feeling of being snowed in, curling up in my bed with my teddy bear and a good book and knowing that there's milk in the fridge and bread in the cupboard (because don't you know all you need is bread and milk to ride out the storm). It's such a homey feeling, a special feeling. I love that feeling too. Watching the snow pile up, safe indoors, with nothing to do but read and eat and cuddle. It's like an adventure that happens outdoors, with a perfect view!